Leyland cypress is hybrid of the Monterey pine and Nootka falsecypress with a natural conical shape, dense, feathery foliage and rapid growth (3 feet per year). They are popular as Christmas trees in the Southeastern states, particularly the forest green Leighton Green cultivar. They must be pruned young, as mature specimens can top 70 feet, but they take well to pruning, even twice a year. Leyland cypress may grow into an acceptable Christmas tree with very little pruning, but for an ideal shape, growth that is outside the desired conical form should be removed early and often. Prune 1-year-old Leyland cypresses when seedlings reach 3 to 4 feet. Shaping is required early and regularly to keep the tree’s growth in check. Cut all branches off the base for 6 to 8 inches, using sharp shears at the first pruning to establish a handle to move the tree. Prevent the formation of double trunks by pruning large branches from the base of the cypress in the spring to leave a single main stem. Watch for lower branches that grow as tall or taller than the trunk. Remove them by cutting them as close to the bark as possible. Eliminate these excess leaders early, when trees are first transplanted. Remove diseased, dead or broken branches in July to prevent diseases from infecting the wood. Spray with a fungicide after pruning to prevent fungus from infecting the cuts. Follow the label instructions for dosage. Shape the cypress into a Christmas cone form when it is the desired height. Smooth the side growth from the upright branches, using pruners or electric shears, which produce smooth lines. Reach the top of the tree, using a ladder, and create the point of the cone, Continue the lines down the bottom half to form a perfect pyramid. Leyland cypress is a hybrid and reproduces only from cuttings. Use the cut or pruned excess leaders as cuttings to root more trees. 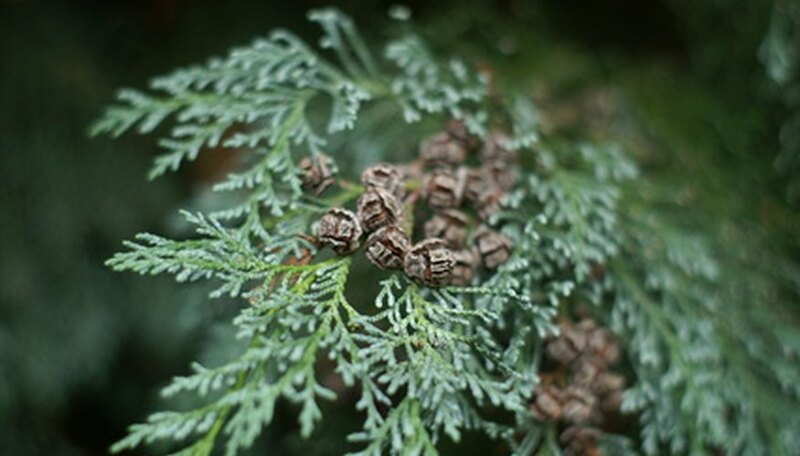 Leyland cypress tolerates pruning and topping well, The sides can be cut without affecting tree growth.